Growing up my family almost always had standing rib roast for Christmas dinner so when Matt I found it on sale we decided to make it for my parents for New Year's Day. The question was how exactly to roast it. This is such a beautiful piece of meat it doesn't need much seasoning & a good slow roast seems best. 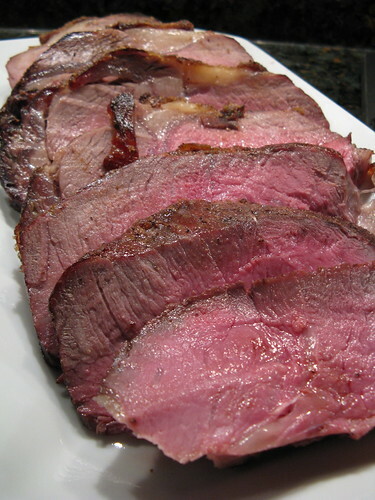 Matt found the recipe for Foolproof Standing Rib Roast from Paula Dean & it seemed like just the thing. Let the roast stand a room temp for 1 hour. 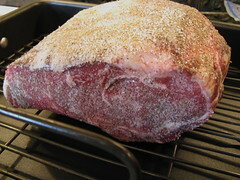 Preheat oven to 375 F. Rub the roast with 1 part salt, 1/4 part black pepper & 1/4 part garlic powder. Place rib side down, fat side up in a roasting pan with a rack. Roast for one hour then turn the oven off. Leave the roast in the oven for 3 hours, DO NOT OPEN THE OVEN. 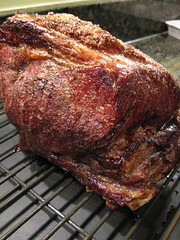 About 1 to 1 hour 20 minutes before serving turn the oven bake on to 375 F. Reheat the roast for 30 - 40 minutes. A thermometer should register about 140. 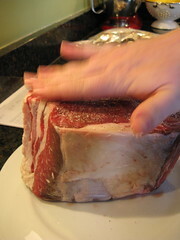 Remove from oven & let sit 30 minutes before carving. The tricky thing about making this roast is planning the sides since you can't open the oven until 30 minutes before dinner. I made Potato & Onion Gratin which only needs 30 minutes to cook so it went in after the roast came out. Matt decided to also make Yorkshire Pudding which can also cook in the time the roast rests. He kept things pretty homestyle & made one large pudding instead of individual ones. This was so wonderful with the roast (of course the English have known that forever). My parents were really blown away with it. Preheat oven to 400 F. Pour the beef drippings into an 8" x 8" pan. Let the dripping heat in the oven for about 10 minutes. Mix the remaining ingredients together. Pour into the hot pan & return to the oven. Baked until puffed & set about 20 minutes. I made Paula's Foolproof S.R.R. and do you know how hard it was not to open that oven?????? I would have been blown away too! Great job you guys! Maybe once and for all I'll be able to make a roast properly. Kat, I left a response on our blog for you. You have to have yorkies with beef - my favourite roast!! ...and yet another method for Prime Rib. I feel like I have to try them all...this looks real good. 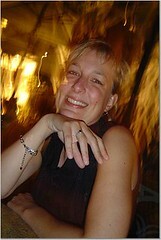 Love this new method and your photos prove this way is amazing!! So what makes Yorkshire Pudding a pudding? It looks like a type of bread to me. Does it have a pudding-like consistency? I guess I will have to try it with your great looking roast. My husband would be kissing my feet if I made it. EAT! - Here's the best answer I could find "Pudding. A term describing several different desserts, usually cooked, including cakelike confections such as plum pudding; or a dish of suet crust containing fruits and sugar; or a spongy steamed dish; or a pastry crust filled with chopped meats, like kidney; or Yorkshire pudding, a crisp, breadlike side dish made from a flour-and-egg batter cooked in pan drippings; or, as is most usually in contemporary usage, milk-based dessert made with flavorings like chocolate or vanilla cooked with a starch until thickened and then cooled until well set. Eighteenth and nineteeth-century cookbooks refers to any and all of these as puddings. The word seems to derive from the Old French boudin, (sausage), and, ultimately, form the Latin botelinus, for many puddings were a form of encased meat or innards. The earliset examples of this word in English refer to such dishes. Dr. Johnson's Dictionary (1755) defines the word as a "kind of food very variously compounded, but generally made of meal, milk, and eggs." One of the earliest American desserts was a quickly thrown-together mixture of cornmeal, milk and molasses called "cornmeal mush" or "hasty pudding," known at least since 1691...In the present century a pudding almost always means a soft-textured, milk-based dessert, the most popular being those packaged commercially and a large number of which, called "instant puddings," require no cooking at all..."
Oh my, looking at that roast makes me a little weak in the knees. Beautiful roast! But I'll be falling and tripping over that Yorkshire pudding. . .YUMMY! We had this for Christmas this year and it was the BEST! CHRISTMAS! DINNER! EVER! That meat is perfectly cooked! I wouldn't have believed it reading the recipe. In America is pudding always a custardy/blancmange sort of thing? I can see why there would be confusion if you hadn't travelled much! what a classic meal. I need to eat at your house. Looks delicious!! 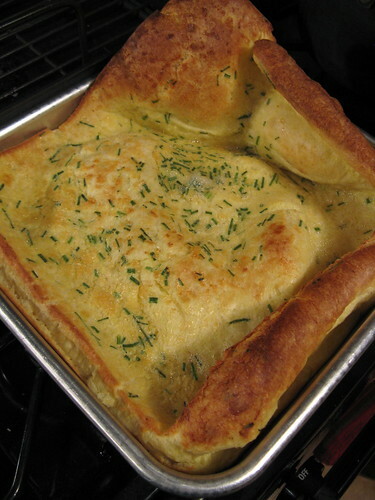 One of my favorite things in England was the Yorkshire Pudding, but I can't seem to make it well on my own. I'll have to try your recipe! I have to bookmark this page for Christmas this year, thank you for sharing this, it all looks amazing and perfect.